Can you believe that we are already into August and back to school is knocking on our doorstep? This summer flew by with crazy stormy weather and a recent heat wave that has me excited for cooler fall weather. Elite Eye Care is in full swing with our back to school prize and eye-wear savings wheel. Any child who gets their eyes checked now through the end of the month gets to spin our fun wheel and is guaranteed a prize! With the start of school also means it is the start of the 2018-2019 sports seasons. I am excited to participate and support the “Meet the Marauders” soccer camp this Sunday (August 12,2018) at the University of Mary. 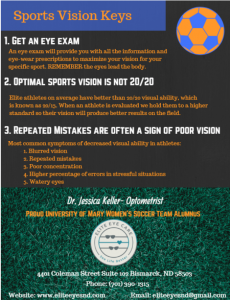 Here are some keys to having “ELITE” sports vision and performance that we have provided for parents and athletes attending this camp. Clear and comfortable vision is so important in the classroom and on the field. So, get your eyes and children’s eyes checked before it’s too late! Hope everyone has an amazing time getting back to school and into your routines.